Disclosure: I received complimentary coupons to use at Rita's Italian Ice. The opinions and views are my own. I have a tween and a toddler. Talk about covering both ends of the spectrum. I never know what kind of emotions, situations or chaos that is going to be thrown my way at any given moment. Life has changed so drastically over this past year; some good and some bad. But I wanted to see if my oldest felt the same way. To make sure I wasn't just being my normal, hormonal self. I bravely asked him his thoughts on having a new brother. Me: "How do you feel having a little brother?" Kaden: (begins to answer, then pauses) "I like it." I start filling in the blanks of empty space. He always gives me simple answers that leave me wanting more. Me: "Is anything different? What don't you like?" Kaden: "We can't really just get up and go like we used to. Now, we have to do all this stuff before we can even leave the house." Me: "I know. It's hard. It's a lot of work. Sorry." We both sat there in silence. In that instance, I felt so guilty. I may have even teared up a little. I felt responsible for my son's disappointment with his current situation. I mean, it could be bad. Even worse. But I completely understood what he meant. At least he said he was more upset about the situation and not that he had a little brother. That was a huge relief. 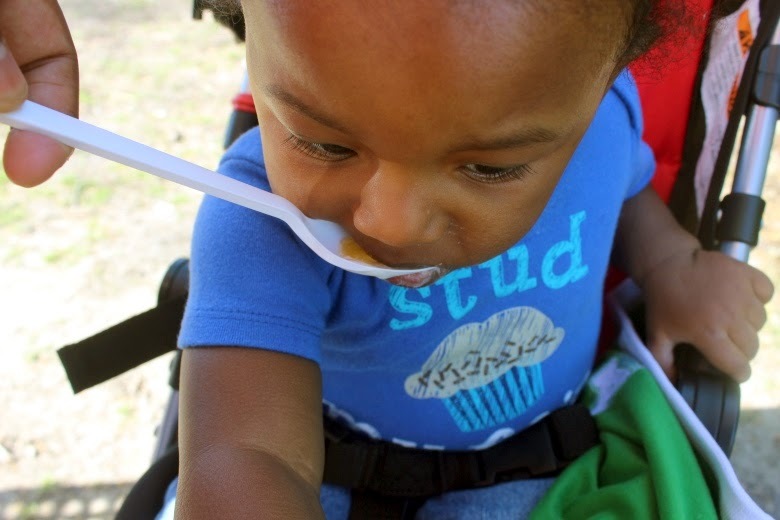 Caring for a baby is demanding and much of your time goes to them. But I somehow had to figure out how to balance the two because I was a Mom to them both. After that conversation, I told myself that I would make an effort to do more things with my oldest. Even it meant something simple and short. A break in our hectic schedule of shuffling around to practice, school events and other obligations. 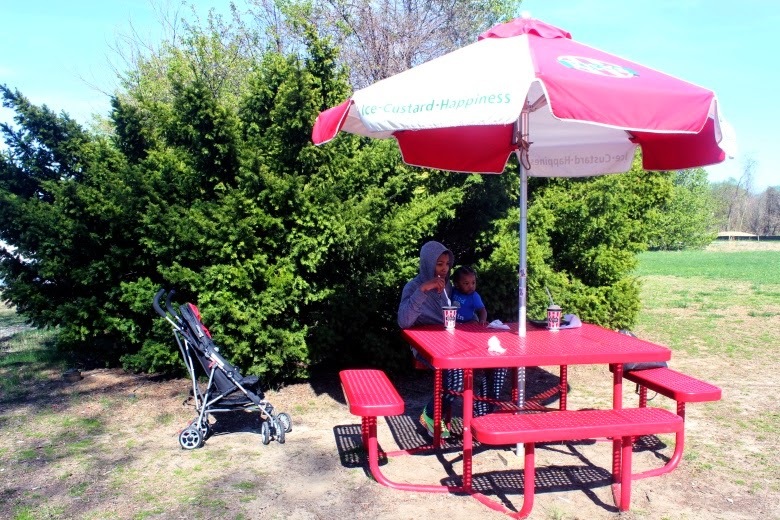 Our first stop – Rita's Italian Ice! We stopped in to the Dunkirk, MD location. 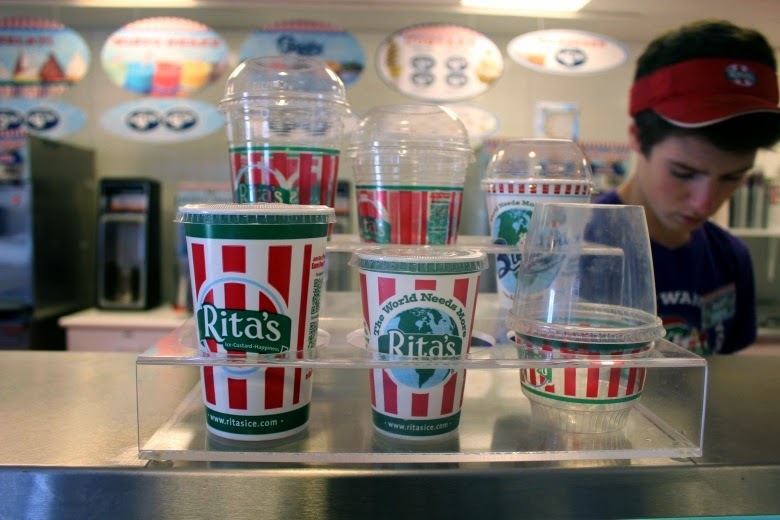 We have a few Rita's in the area that we can visit, so this makes it convenient whenever we have a taste for something cool. With the weather finally heating up in Maryland, I am sure we will be visiting more often. And with coupons to Buy One, Get One Free being sent to my e-mail inbox, I definitely will take the boys to Rita's more. 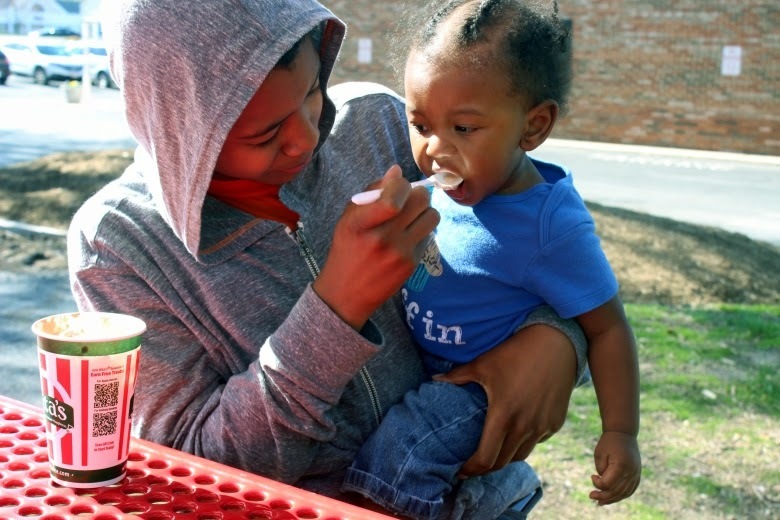 Rita's Italian Ice is always introducing fun, new flavors to their menu. They also host awesome giveaways, sweepstakes and promos from time to time. I like to look at the signage and displays when I visit to stay up-to-date on all their changes. 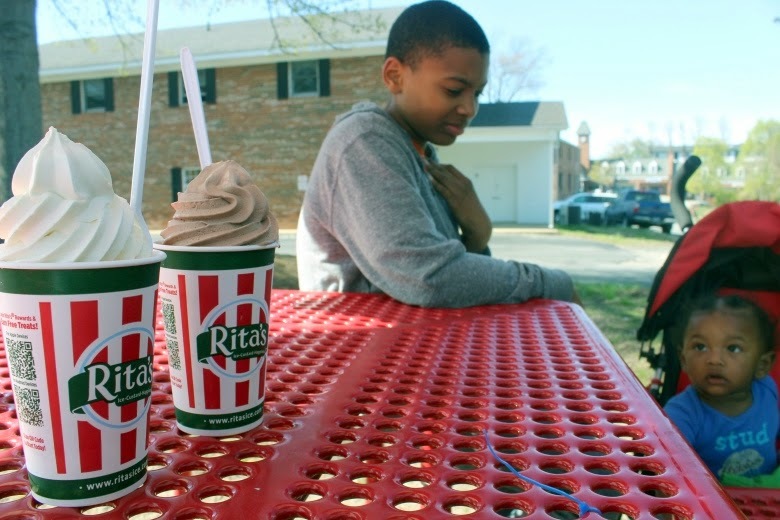 If you have never been to Rita's Italian Ice before – first, what's your problem? Second, there are a few ways to 'chill out'. You may want to take a look at all of their delicious treats. You wouldn't want to hold up the line reading the menu, now would you? Trust me, there will be a lot of eager customers who want to get their hands on some Rita's. Be prepared. You can also sample the ice flavors when you visit if you aren't sure what to choose. I secretly try them out every time. Shhhhhh!!! On this visit, we ordered a gelati. This is a combination of ice, topped with frozen custard. It's a popular item at Rita's. I ordered mango Italian ice with vanilla custard. My son opted to get the Starburst orange ice topped with chocolate custard. A medium size was plenty. I could barely finish it all. Luckily, we had Liam with us now. 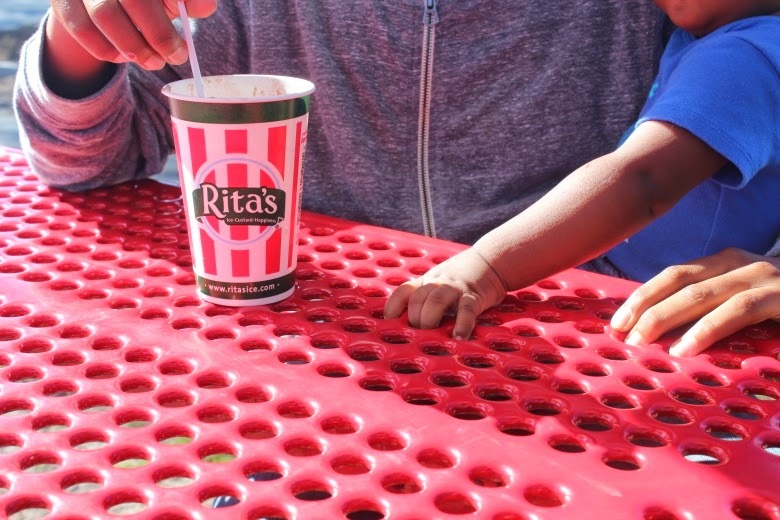 It was his first time testing Rita's out. He loved it. Liam could not get enough. He kept coming back for more. I think he needs his own cup next time. The outside seating is a great way to relax. Instead of enjoying our treats on the go (and getting stuff all over the car like we usually do), we sat at the tables located just on the side of the building. You can't really miss them. 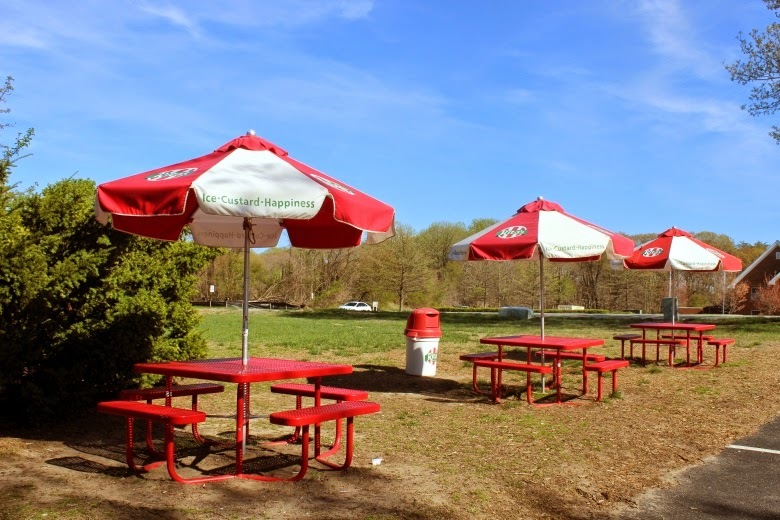 They are red with umbrellas housing the Rita's Italian Ice logo. We were able to talk about the day. I asked Kaden about school. We laughed at Liam. We watched the cars go by on a near-by road. We heard birds chirp, bees buzz and the rustling of the trees. It was a perfect weather day, a little breezy, but just perfect. 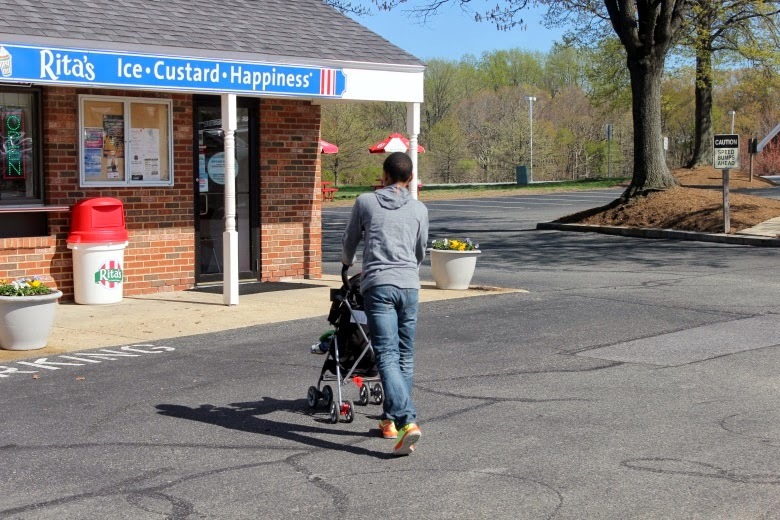 The sun did not melt our custard as fast as a hot summer's day would have. All in all, the day served it's purpose. We took a moment to stop and 'chill out'. It may seem like a small accomplishment in my attempt to spend time with my oldest, but it was a big deal. I bet I'll be able to reference this day and say, "Remember that day we went to Rita's?" That, to me, is already a win. Do you want to take some time out to 'chill' with your family? 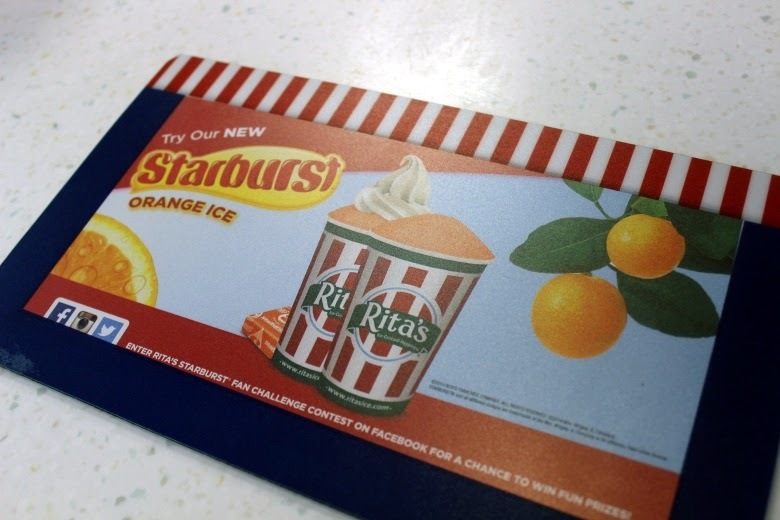 Enter my giveaway below to win a $25 gift card to Rita's Italian Ice. Before you enter, check to see if you have a Rita's location near you. I received complimentary coupons to use at Rita's Italian Ice. The opinions and views are my own.